It’s CMJ time in NYC once again, and our good friend LILY VANILLI has teamed up with Rotting TV to put together a killer FREE showcase of bands, producers and DJs this Thursday night at Hotel Chantelle. The band/artist showcase kicks off downstairs in the main bar at 7pm, with Cleveland-bred, Brooklyn-based indie/alt/hip-hop production duo The Kickdrums, Houston garage-pop outfit Young Girls, Norwegian electronic lo-fi duo AACT RRAISER, New York wonderboy producer Sweater Beats, songwriter/rapper/vocalist Justina, and electro/pop/soul vocalist ANE. The afterparty takes over the rooftop at 10pm with New York-based MCs MaG and Danse Daimons rocking alongside Austin shining-star (and buhbOmp homie) DJ Mike Swing and Chilean-born, Miami-based DJ Manuvers. A gang of folks are co-sponsoring this bad boy, including MANIMAL, our good friends at Hash Magazine, The Interstellar Pig and our beloved Impulse Travels radio show. So much different kinds of good involved in this, it would be ridiculous to miss it. 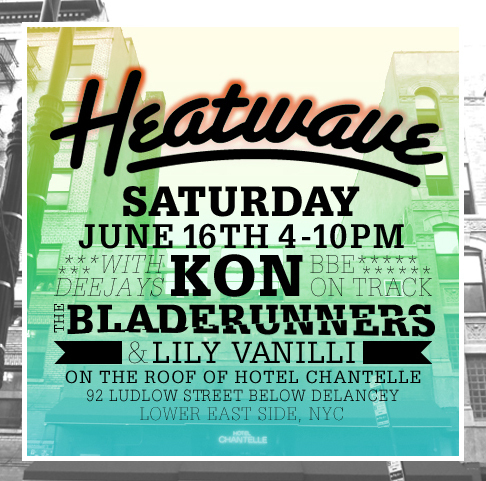 Not to be missed: This Saturday, LILY VANILLI presents beat digging and edit legend KON (of Kon & Amir/BBE Records), plus the mighty BLADERUNNERS (DJ7L + DJ Braun Draper) at one of the hottest spots of the summer, LILY’s day-to-night HEATWAVE party on the rooftop of Hotel Chantelle. The music will be unquestionably great, the cocktails delicious, and (if you get there early enough) the crêpes superb. The weather should be spectacular this weekend—perfect for an open roof—so stop by for a late brunch, early dinner, or just some great drinks with friends and super-talented talented DJs spinning amazing music. And to top it all off, it’s FREE. 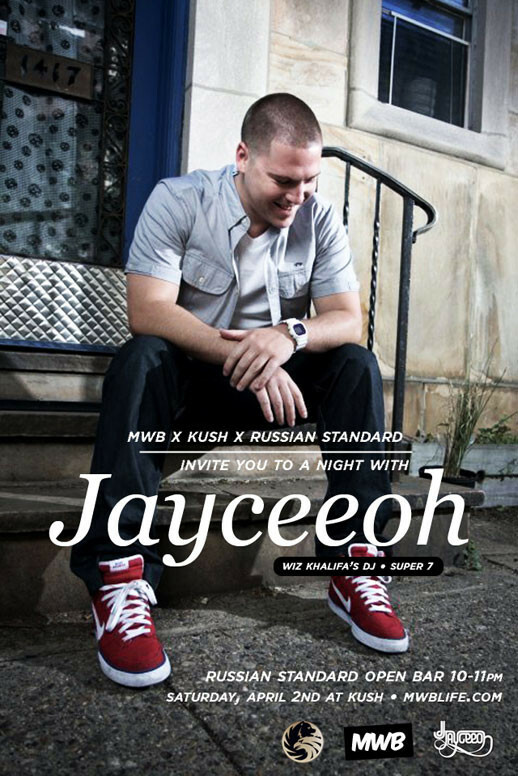 JayCeeOh, tour DJ for Wiz Khalifa and winner of the 2011 McDonald’s National Flavor Battle, makes his way back to NY to rock it with the MWB crew. He recently took his talents to the West Coast, so we’ll call this a bit of a homecoming for our friend. He’ll be coming to us live right after a successful tour across the EU and after shows in Austin for SXSW. We’re psyched to have him because he’s without a doubt one of the most in-demand DJs in the country. Dude’s been killin’ it! The MWB Crew, Kunal Merchant & Seif Al-Din, will set things off before JayCeeOh hits the decks. Known as the best selling vodka in Russia – which actually says quite a bit – Russian Standard will be on board, hooking you up with free drinks from 10-11pm and we’ll have them as our featured bottle special of the night. Message any of the admins on the facebook invite for a great deal if you want to rock a table or booth the night of, or if its your b-day, or if you want to reserve space for your crew. The drinks start pouring at 10, so come prepared. Kush is the destination, and as usual, you can order food early and hookahs all night. Ask for the MWB special and they’ll take care of you. Your RSVP Matters: so make sure you do, or you may get charged at the door. /// This month’s party will feature DJ AFRO-MARC, renowned for his two popular online outlets, The Afrobeat Blog (http://afrobeatblog.blogspot.com) and The Afro-Marc Podcast (http://djafromarc.podomatic.com), where he has been spreading his love and knowledge of African music and all things funky. Afro-Marc has promoted and spun at parties featuring some of the area’s best African-inspired music artists such as Chico Mann, Superhuman Happiness, Ikebe Shakedown, and Akoya Afrobeat Ensemble. As a writer, he has interviewed African legends Tony Allen, Salif Keita and Femi Kuti, as well as newer African-inspired artists Bajah and the Dry Eye Crew and Antibalas, among others. He also covers world music as a regular contributor to The Huffington Post. As it does every month, Afro-Dub Sessions will also feature a pair of live performances by resident band SUPER HI-FI, which has been packing the house with their creative melding of Afrobeat, Dub, live remixing and special guest appearances. The five-piece collective features members of Aphrodesia, Slavic Soul Party, The Superpowers, and the Blue Man Group. 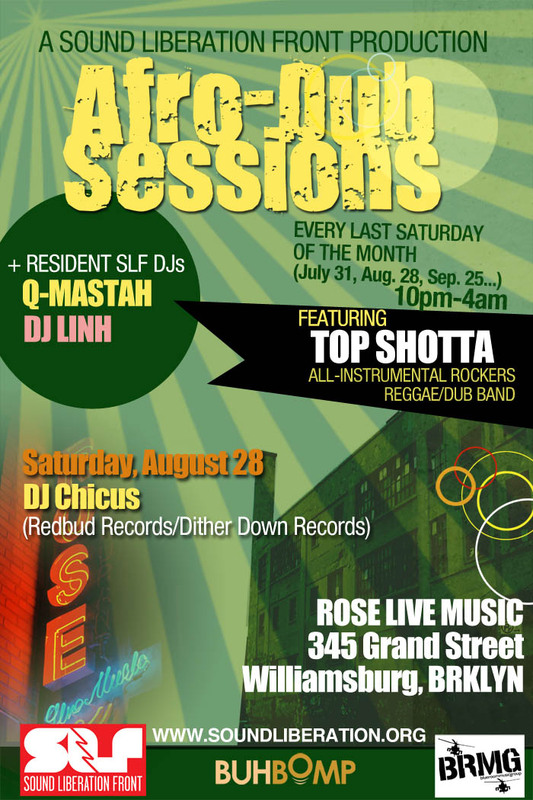 SLF’s resident DJs LINH and Q-MASTAH will bring their diverse musical selections to the turntables to round out the night. /// This month’s AFRO-DUB SESSIONS will feature Redbud Records founder DJ CHICUS, who through his label has released dub, roots, dancehall and electronic 12″s and 45s with contributions from such producers as Ticklah, Victor Rice, Biggabush, Zeb, Inverse Cinematics, Al-Haca Soundsystem and others. As a DJ, Chicus has performed internationally with artists such as Jazzanova, Daz-I-Kue, Domu, Vikter Duplaix, Stereotyp and Sister Carol, and has manned the decks at NYC institutions such as Koncrete Jungle, Turntables-on-the-Hudson, Afrokinetic and Organic Grooves. Chicus and the Redbud crew also hosted the long-running DubTempo party in Brooklyn. 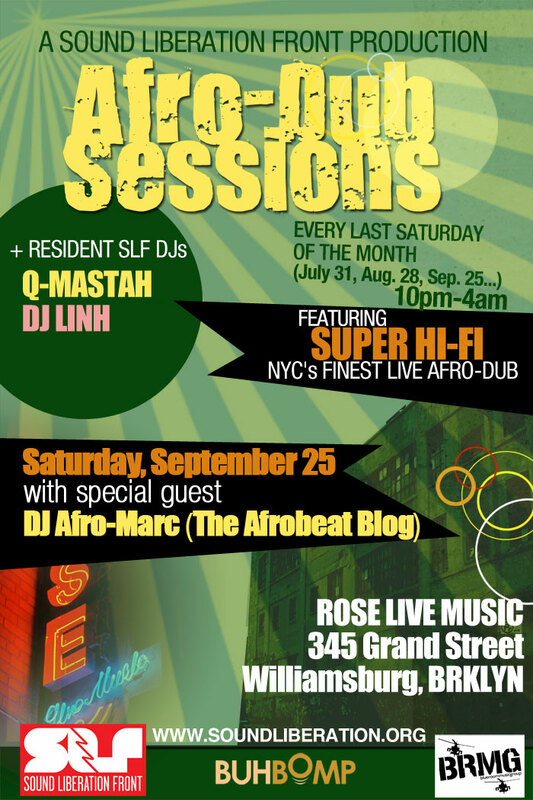 Also this month, Afro-Dub Sessions will feature live performances by special guests TOP SHOTTA. Led by trumpeter/producer djMush1 (formerly of the Slackers, Murphy’s Law, Fireproof, and The Scorchers). Top Shotta is a Brooklyn-based rocksteady, reggae and dub seven-piece. The band gives new life to classic Jamaican riddims, and is fronted by legendary foundation dancehall singer PETER RANKS (of Barry G’s Wha Dat Sound, Sons Junior and Terrorist Sound). SLF’s resident DJs LINH and Q-MASTAH will bring their diverse musical selections to the turntables to round out the night. Ska, Rocksteady and Reggae on the beach in a traditional Jamaican yard style! The D, F, N, and Q all stop at Coney Island/Stillwell Avenue, and it’s a short stroll to the boardwalk from there, and you head in the direction of Nathans and the red Parachute Jump Tower and the pier. Listen for the music — you’ll hear it and then see people dancing!! 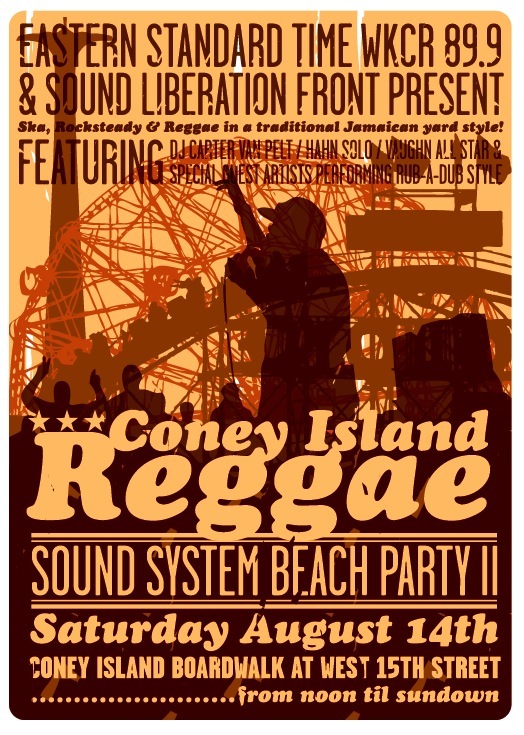 /// WKCR’s Eastern Standard Time and the Sound Liberation Front team up to present CONEY ISLAND REGGAE SOUND SYSTEM BEACH PARTY II on the Coney Island Boardwalk. The all-day event (from noon to sundown) is free and will feature live DJs and special guest artists combining to bring the enormously influential culture of Jamaican sound systems to the Brooklyn beach. Among the featured DJs for the event are DJ CARTER VAN PELT, host of Eastern Standard Time; HAHN SOLO, lead guitarist and dub engineer for Dub Is A Weapon; and VAUGHN ALL STAR, a selector for King Crown International sound system. Sound systems took over from orchestras in Jamaican dancehalls in the 1950s and became part of nearly every development in Jamaican music: Ska, Rocksteady, Reggae, Dancehall and so on. Because sound system dances were one of the few things poor people on the island could call their own, the parties became central to downtown life and the local economy. Competition for the best equipment and the most exciting music was fierce and became the driving force behind the evolution of the island’s music industry as sound system owners turned to record producing. For fifty years, the natural medium for Jamaican modern music has been the sound system dances. The music was produced and designed specifically for sound systems to play, and for the enjoyment of the people attending the dances. Wherever Jamaicans have traveled, from London to New York and beyond, sound systems have been part of their luggage. The legacy of sound system culture can be found in many forms of popular music around the world. /// This monthʼs AFRO-DUB SESSIONS will feature HAHN SOLO (aka Dave Hahn), best known as the lead guitarist and dub engineer for DUB IS A WEAPON, a group that has toured throughout the United States and Canada with heavyweight dub legends Lee “Scratch” Perry and Scientist. HAHN SOLO has quickly made a name for himself as a roots reggae and dub selector who serves up his favorite cuts strictly on vinyl at NYC hot spots like the Bowery Ballroom, APT, Southpaw, and the Mercury Lounge. He also has made guest appearances on WKCR-FM. The night also will feature two performances by SUPER HI-FI, New York’s hottest Afro-Dub band which has been rocking it each month with their creative melding of Afrobeat and Dub. 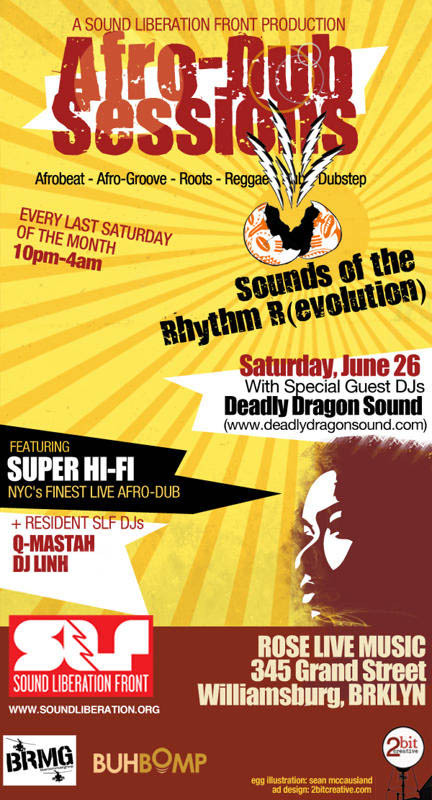 /// This monthʼs AFRO-DUB SESSIONS will feature a guest DJ set by New York reggae specialists DEADLY DRAGON SOUND SYSTEM. Since migrating from Chicago 12 years ago, the DJ collective, whose members include Scratch Famous, Selector JD, Queen Majesty, and Mr. K, has become a major player in New Yorkʼs richly populated reggae scene with numerous residencies, a weekly radio show on East Village Radio, and the groupʼs world renown record shop at 102-B Forsyth St. in Chinatown. DEADLY DRAGON is also known for its live events featuring performances by some of the biggest names in reggae, including Johnny Osbourne, Yami Bolo, Mighty Crown, Down Beat, Stone Love, Shabba Ranks and much more. The homie and fellow DJ / producer, DJ (Omar) Morsy, recently had his DJ equipment stolen. As a result, his friends are putting together a benefit to help raise some dough to help him regain the tools that allow him to make his living. If you’re in NYC, it would be great to see you out at the benefit. Help out the homie – break off some bread, offer some used equipment or hook-ups. There will be DJs, live performances and OPEN BAR. If you can’t make it out and are interested in making a donation, Morsy is offering digital downloads in exchange for your contribution. Hit him up at nanachill@nanachill.com. Anything is appreciated! Thank you for your efforts. Please spread the word! For those of y’all in New York this week, I can’t recommend this event enough. 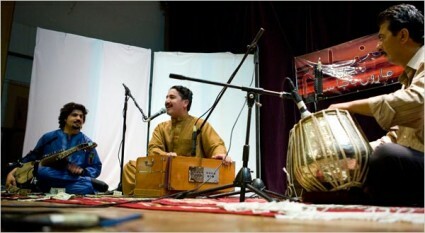 Haroon Bacha is one of Pakistan’s most celebrated Pashto singers. Because of his music’s messages of tolerance and pluralism, he became a prime target of the Taliban’s deadly campaign against music. In 2008, he was forced to flee the country, leaving behind his family, and seek asylum in New York City. Determined to continue making music, Haroon has recorded a new album and begun working with Radio Liberty in Washington, D.C., where he hosts cultural and musical programs with the Pashto service. This will be Haroon‘s first concert for the general public in New York, and he will be accompanied by master musicians Mohammad Essa on the tabla and Pervez Sakhi playing the rabab. You can get more info from the facebook event page. Tickets are available on Ticketfly or via the littlefield website. Here’s an interview SLF‘s Ezra Gale did with Austin Dacey recently, discussing music censorship, Haroon Bacha, and the upcoming The Impossible Music Sessions.